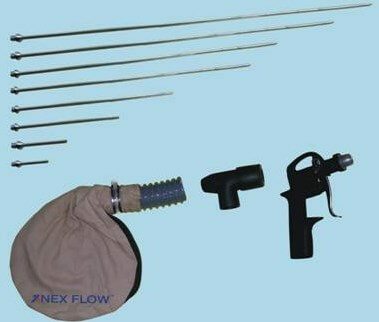 X-Stream™ Blind Hole Cleaning System comes complete with a hose clamp and material collection bag (F), connected to the Cleaning Gun (B) using a plastic hose connection. Compressed air is supplied to the unit via the custom air hose (A). The replaceable hole adaptor (E) is connected to the Cleaning Gun. Simply place the hole adaptor (C) over the slot, or hole or container to completely cover the hole. Press the handle on the Cleaning Gun to blow compressed air into the slot, hole or container via the nozzle (D) to remove the debris. Once the bag is filled, remove the bag with the hose clamp, clean and replace.